Nowadays software developers are creating innovative ways to make use of everyday items which we normally overlook. Take the barcodes on products for instance. You would not have thought that those patterns of black lines could serve any purpose other than help you check out of the shopping store. But Stickybits makes use of them in a brilliant way. Imagine having access to a public URL that you can upload unlimited content to. Not only you, but anybody who visits the URL has the power to upload whatever type of file they want. Any visitor to the site will be able to see what other visitors uploaded thus creating a unique sharing experience. That is Stickybits’ aim. Stickybits is an application for iPhone OS and Android OS running devices. 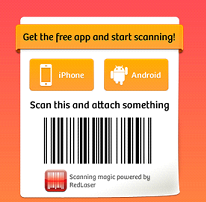 It lets you scan the barcode of a product by taking a picture of it. You can then attach whatever type of file to that barcode. This means that you upload the file to a server and barcode is used as the file’s key. There is no limit to the number of files you attach to the barcode. Other people can do the same. They can pick up the same product and attach as many files to its barcode as they want. While they do this they can view any content previously attached to the barcode. This simple technique has a huge potential to progress into something massively popular. Imagine attaching picking up a cooking ingredient to find countless recipes attached to its barcode; or printing out a bar code on your business card with a detailed C.V. attached to it. Stickybits has truly pushed the boundary of innovation in software and deserves two thumbs up.